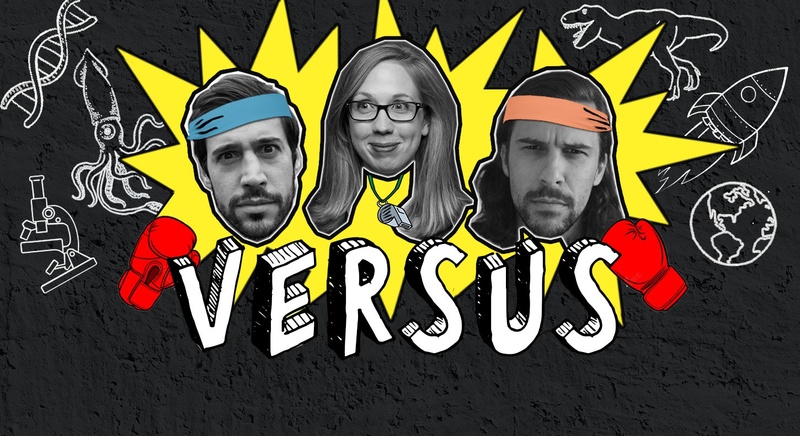 Your hosts Meg Pierson, Zak Martellucci, and Dustin Growick lead a rotating cast of special guest experts in a battle royale of serious—and not so serious—topics. Who will come out on top? Dinosaurs or mammals? Biology or physics? Space or oceans? Chock-full of trivia, games, and prizes, the show will conclude with the answer to an age-old question. The winner is up to you, as audience endorsements and YOUR vote will ultimately determine which team is crowned champion of VERSUS. Repping Cats: Imogene Cancellare (@biologistimo) is a conservation biologist, science communicator, and professional cat scientist. When she isn't busy eating good noodles, or thinking about noodles (which has nothing to do with cats), she's researching snow leopard genetics as part of her PhD research at the University of Delaware. Imogene has the chops and the enthusiasm to convince you why any of the 37 species in Felidae are better than any other mammal. Imogene can be found online via twitter and Instagram talking about wildlife and conservation, diversity in STEM, and why anyone can enjoy the outdoors. And cats. Repping Dogs: Courtney Garrity was actually raised by wolves. She has mostly assimilated to human culture, but is still always the girl at the party cuddling the dog. She would have ten of her own, but spends most of her time rehabilitating abused and neglected dogs at the ASPCA Canine Annex for Recovery and Enrichment. She is also a research scientist in the Horowitz Dog Cognition Lab at Barnard College and a wildlife rehabilitator at the Wild Bird Fund. In past lives, she has worked rescuing/rehabilitating/releasing seals and sea lions at the Pacific Marine Mammal Center and caring for mountain lions in a private sanctuary. She studied Earth Science at Columbia University and just generally wants to fix the whole planet. Soon.